Air Force photograph by Staff Sgt. Vernon Young Jr. 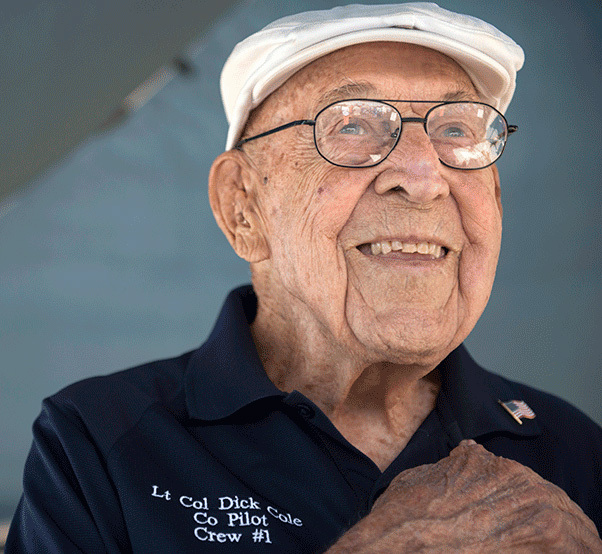 Retired Lt. Col. Richard E. Cole, copilot to Jimmy Doolittle during the Doolittle Raid, smiles as he honors the U.S. flag during the singing of the National Anthem at an airshow in Burnet, Texas. Cole was honored by the community and guests as the only remaining military service member alive from the April 18, 1942, Doolittle Raid. Cole was born Sept. 7, 1915, in Dayton, Ohio. 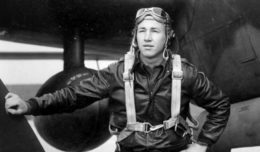 In 1938, he graduated from Steele High School in Dayton and attended two years of college at Ohio University before enlisting as an aviation cadet on Nov. 22, 1940. Soon after he enlisted, Cole received orders to report to Parks Air College in East St. Louis, Ill., for training before arriving at Randolph Field, Texas, and later, Kelly Field, Texas. He completed pilot training and was commissioned as a second lieutenant in July 1941. While Cole was on a training mission with the 17th Bombardment Group at Pendleton, Ore., word came that the Japanese had attacked Pearl Harbor. The 17th BG flew anti-submarine patrols until February 1942, when Cole was told he would be transferred to Columbia, S.C. While there, he and his group volunteered for a mission with no known details. Cole would later say that he thought his unit was heading to North Africa. For weeks, Cole practiced flying maneuvers on the B-25 Mitchell, a U.S. Army Air Corps twin-engine propeller-driven bomber with a crew of five that could take off from an aircraft carrier at sea, in what some would call the first joint action that tested the Army and Navy’s ability to operate together. When the carrier finally went to sea to bring 16 bombers closer to maximize their reach, it wasn’t until two days into the voyage that the Airmen and Sailors on the mission were told that their carrier, the USS Hornet, and all of its bombers, were heading in the direction of Tokyo. In an age-before mid-air refueling and GPS, the USS Hornet weighed less than a quarter of today’s fortress-like aircraft carriers. With Cole as the copilot to then-Lt. Col. Jimmy Doolittle, the B-25 Mitchell bomber #40-2344, would take off with only 467 feet of takeoff distance. What made the mission all the more challenging was a sighting by a Japanese patrol boat that spurred the task force commander, U.S. Navy Adm. William F. “Bull” Halsey, to launch the mission more than 650 nautical miles from Japan — 10 hours early and 170 nautical miles farther than originally planned. Originally, the Mitchells were supposed to land, refuel and proceed on to western China, thereby giving the Army Air Corps a squadron of B-25s and a commander. But now the aircrews faced increasing odds against them, in their attempt to reach the airfields of non-occupied China. Still, Cole and his peers continued with their mission.